HomeIGII Tee Shirt DesignsLifestyleMotivationThat's CoolIGETITIN T-Shirts are here! IGETITIN Fitness launched a clothing line! Okay, so I guess it can’t technically be a clothing line until I offer more than one shirt, but it’s certainly a start, right? 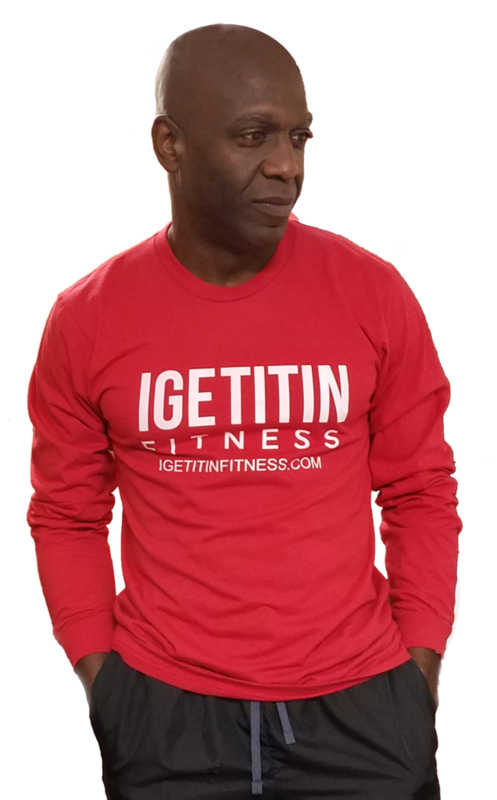 The hottest item this holiday season, IGETITIN Fitness T-shirts, are available RIGHT NOW for purchase. If you don’t care about the back story and just want to order one (or twenty), you can visit the store here. 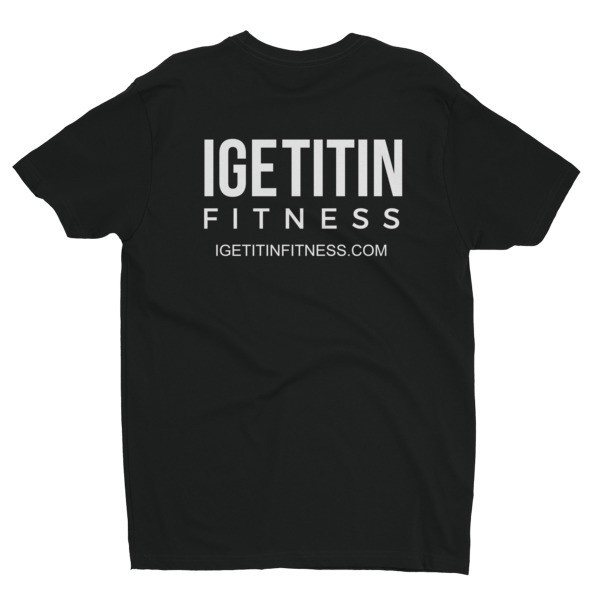 Show your support for IGETITIN Fitness by picking up your high-quality T-shirt today! Featuring the logo fo the IGETITIN Fitness, this bullet proof and sweat proof (not really) shirt is guaranteed to make you ready to get it in while letting others know that you know how to get it in! You will also be 30% more awesome and your friends 50% more jealous. It will be on of the most comfortable shirts you’ve ever owned. I’m not kidding when I say it’ll be one of the most comfortable shirts you’ve ever owned. I’ve been wearing these American Apparel shirts for the past two years and I honestly find it hard to wear anything else. I wanted a shirt that felt like…but not smelled like…an old, well-worn gym shirt. So, go and pre-order your shirt and tell the world with your shirt that…hell yeah, IGETITIN. These shirts tend to run a little on the smaller side of normal, so make sure you check the sizing chart before ordering one! The shirt has the Official IGETITIN Fitness logo on the front, to let the “non-getitin’rs” know that you GETITIN. On the back of the shirt there’s a small logo in the middle of the upper back with the IGETITIN Fitness URL underneath it, so the wannabe’s will know where they can get one. Hand-printed with eco-friendly ink on black, white or red American Apparel Tri-blend Track Tees. An additional $2.50 for shirts that are 2XL (that’s the cost that is passed on to me for the larger shirts). Available in both Men’s and Women’s styles/sizes. Sweat Proof, Work Out Proof, Bullet Proof, Nuclear-resistant, and attracts Haters. Will make you instantly appear more attractive and awesome to those around you. So what is taking so long? I don’t like cheap stuff but I initially considered selling shirts on sites like Cafepress or Zazzle, but they would have required me to charge an insane price for a simple shirt ($30+ before shipping) and it wouldn’t have been printed to my specifications on the right kind of shirt. I knew I had to focus my time on building a sustainable online fitness business first, which is why the shirts went to the back burner while I finished up the IGETITIN Fitness Guide (Coming 2017). Now that I’ve officially established my online fitness business, I figured it was time to unleash these slamming t-shirts upon the world. They easily integrate with my WordPress site and all major ecommerce platforms. They have friendly, responsive support staff to help you out, so how can you loose! ThePrintful.com rocks, so they’re not only printing my shirts, but handling the fulfillment of all orders as well. This means that you get a quality product created and shipped by an established business with a proven track record of great service. It also means that I’ll be free to continue doing things like IGETITIN training. Orders start NOW, and shirts will start shipping immediately, just in time for Christmas! I know the community of IGETITIN Fitness is a force to be reckoned with, and I have no doubt in my mind it will become a brand to be reckoned with as well in the very near future. This is where I need your help. I’ve been writing free articles twice a week here on IGETITIN Fitness. If you’ve gotten anything useful out of the site during that time, consider supporting my efforts and IGETITIN Fitness by ordering a shirt today! They make great Christmas/Hanukkah/Festivus gifts! So here’s the deal: If you order a shirt send me an email to support@igetitinfitness.com and I will send you a FREE copy of our eBook, “Eating for a Healthy Life” a $25 Value yours absolutely FREE! Coming soon…more gear, clothing and apparel to show your support for IGETITIN Fitness and this new movement! If you’re thinking about getting one, grab one early! The 3 Secret Everyday Tips For A Successful Life.